Mission Critical, High Density applications are perfect environments for Eaton’s Monitored power distribution units. These remotely powered plug strips provide reliable power to Data Centers for standard servers and blade servers. Eaton Monitored ePDUs enable remote monitoring of outlet’s current draw using an Ethernet connection. 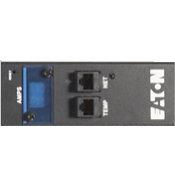 Eaton’s monitored plug strips contain digital Ammeters for simple monitoring and management. The multi-channel Ammeter allows monitoring of current on input and each branch circuit to ensure accurate load balancing. The Ammeter can read up to 8 different circuits. Load balancing, Ethernet monitoring, and designs suited for the lastest rack and enclosure designs make Monitored ePDUs the perfect scaleable solution for your data center.